The first hint of a blind approach in our agility culture came from the onset of the 270 turn. I recall at one time these weren’t legal in the AKC. But I believe they came to the realization that a challenge that is common in FCI play needs to be set up for practice in the U.S. if our players are going to compete in Europe… so the ban on the 270 was lifted. Another common form of the blind approach is a thing we call the threadle (a blind approach requiring two changes of direction). 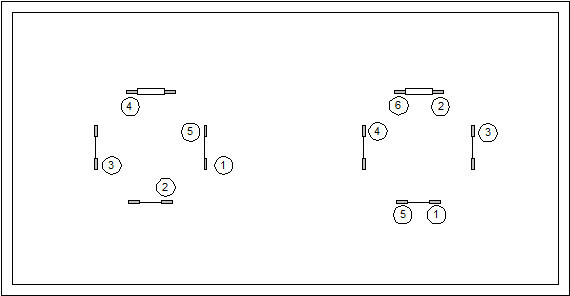 These exercises are courtesy of the letter “A” (box threadles left; 270s right). The blind approach always requires for the handler to shape the approach because it is not a natural or intuitive flow. In other words, the dog cannot be released to work. And more to the point, the course designer is demanding micro-management of the dog. The most common error in the 270, to be sure, is a handling error. The handler fails to step outside the box to shape the turn, and so the dog cuts inside, earning a refusal on the second jump. Have this at the back of your mind… the blind approach always demands micro-management. 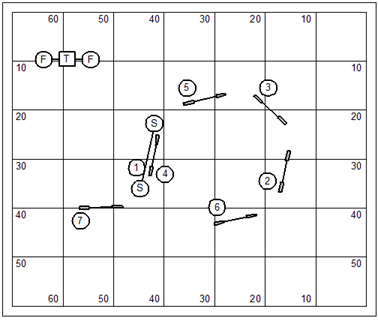 This AAC Jumpers course contains a transition between two jumps that is commonly known as a blind approach or a managed approach. 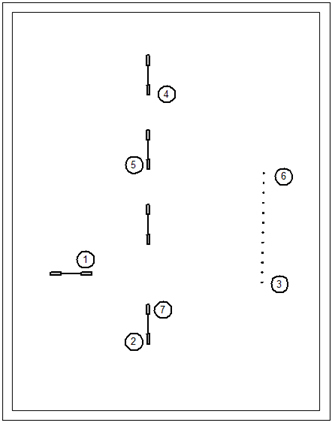 The blind approach occurs in the transition between jumps #5 and #6. 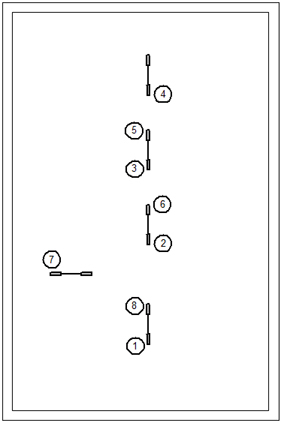 What the handler has to do here is be in position in the gap between the #6 jump and the #15 jump to draw the dog around for an approach to jump #6. If the handler’s a long-legged kid, he can probably sprint down to be in position… forward of the dog. Getting behind the dog is a big problem because any dog with a lot of obstacle focus and a good work ethic will likely take the #6 jump in the wrong direction if the handler is out of position. 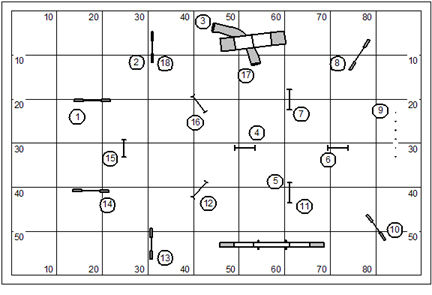 Later in the course, mind you, is a hard wrap at jump #15. Again, the course requires the handler’s presence to manage the wrap. Note that the judge has put a gratuitous dummy jump beyond jump #15. So, unless the handler can outrun the dog he had better have taught the dog some magnificent distance skills to give direction from #7 through #14. The real question that occurs to me … can the blind approach be taught to the dog as a performance option. Be very clear on what this means. I’d like to be able to point out a jump and tell my dog “go around that jump, and come back to me over the jump.” All good training begins with a solid statement of objective. This young man is running a course that features no fewer than four blind approaches (and a threadle to the weave poles thrown in for good measure). Please note that on one of the blind approach challenges he sent his dog forward to get it done (jump #13, following the U-shaped pipe tunnel). The dog, Jack, dropped the bar on this jump which we might blame on the dog not giving himself enough room on the un-managed approach; but then again, the handler stepped in to bend Jack away sharply after the jump which could have been the culprit in the fault. Are you a fox or a hedgehog? There’s an argument for being a hedgehog you know. You know that thing very well and it shapes your complete existence. I’ve heard that Winston Churchill was a hedgehog. He was utterly convinced that the German Nazis were a dire threat to the world. His clarity of vision helped to defeat the German menace. The fox, on the other hand, views the world from more than a single perspective; strives to develop all of his abilities; and survives the complexity of the world by adaptation. The fox knows that one hedgehog’s truth is another hedgehog’s lie. I didn’t completely ignore the call for the bloggers theme. My brain pretty much took me to a different place that became more of a sci-fi saga like Time Cop than the remorseful retrospectives of dog trainers thumbing through their woulda-coulda-shouldas. I’ll share that story with you another day once it has coalesced in my brain. Yesterday I put up a post on Threadles (http://wp.me/pmSZZ-Zt). Armed with by Droid video smart-phone I went into the lower field to demonstrate the handling. And the exercise became fail fail fail. You must understand that I am a hedgehog who puts great store on handling skills. Now I find myself in some cases overmatched being an old man with a young, exuberant, relatively fast dog with magnificent distance skills and obstacle focus. Sometimes it can be hard to “handle” your way out of an exercise that demands that you be in two places at once. Here’s the result: http://youtu.be/29Z0N2oHwEo. Of course I only introduced the command/performance training today (and it took Kory about 2 minutes to learn it). I’m fully aware that the skill isn’t owned/earned without making it a solid part of my daily exercises for several months. The rhythm of agility has ever fascinated me; the handler and dog moving with ease and grace in harmonic symphony. The course itself is like the scroll of a pianola, dictating the beat, a composition enticing dancers on the floor into anything from an elegant waltz to an upbeat quick-step (50 bars/minute). Sometimes the course itself introduces a jangling tone that disturbs the beat. It’s like hearing bad music; the listener winces at the discordant moment. Was it the course… or was it the dancer? The composer might be completely bloody minded. Being too lazy to move the contact equipment I wanted to put up a Jumpers With Weaves course. I could not help but wince at the discordant moments in this course. 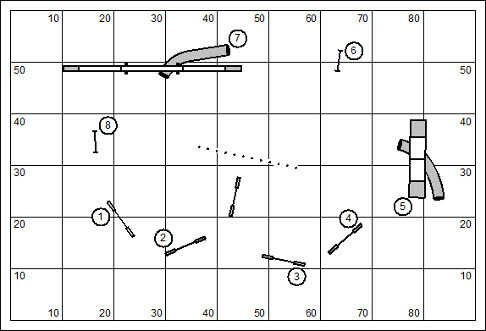 I’ve been occupying myself with a course design riddle that we see all too often in agility these days (particularly in USDAA courses) in which the fast dog handler is obligated to be in two places at once, if not three. Certainly the day goes to the young athletic handler who can race his dog from corner to corner to establish handler proximity in the technical moments. For the rest of us, the mantra is train… don’t complain. This is a bit of a cowardly notion I suppose. I’ll set this course up for league play. Then I won’t be here to run the course with my boy. I’m off to Springfield, IL in the morning to conduct a four-day TDAA judges’ clinic. There are three very technical moments in this course. The first bit is in the transition from jump #7 to #8. The handler has a scarce 8 to 10′ to turn the dog with a looming tunnel option. 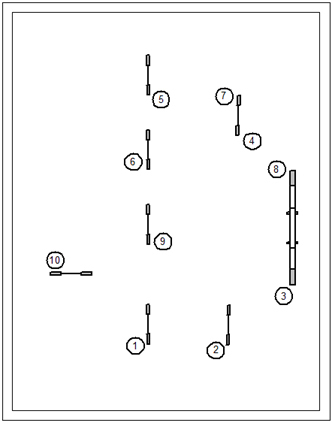 Then the handler has to get to the opposite side of the floor to solve the same sort of option (with the dogwalk looming) in the turn from jump #10 to #11. This is really the tough bit because ideally the handler wants to come out of the turn with dog on right; calling for a perfectly executed serpentine Front Cross. Now the question is whether the handler can establish proximal position for the tricky threadle turn from jump #12 to #13. Ah, bloody-minded indeed. Just so I don’t leave everyone “up the creek”, as it were, I should suggest my handling solution to the course. In order to compete with the young long-legged athletes in our sport some of us old-timers need to rely on superior training and handling skills. That is not to say that we would all succeed with the plan (or even I would succeed). But without a plan we are up the creek, and without a paddle. A thing I’ve always said about pinwheels is the faster the dog is; the farther ahead the handler gets (and if you’ve been training your dogs for independent work in pinwheels in the exhaustive exercises I put up for this purpose in The Jokers Notebook distance training series… this should be no problem for you.) 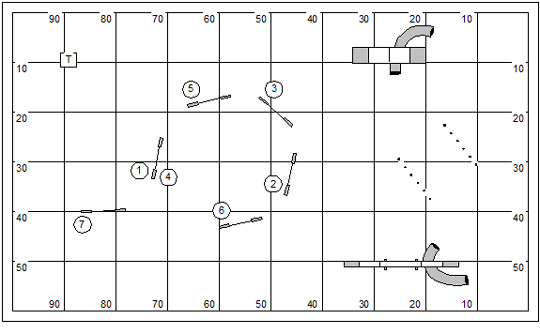 In this part of the course the handler has to pick the dog up out of the tunnel, sending him forward to “own the pinwheel”. 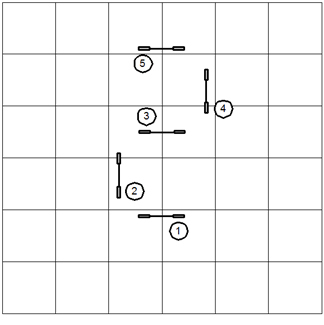 This allows the handler the position he needs to precue the turn from jump #7 to #8. I show the handler with dog on right coming out of the pipe tunnel. Getting this position might be its own sort of riddle, especially if the handler has to step in to the entry of the pipe tunnel at #3 so closely that he can touch it. Note too that I show the handler layering at a distance while the dog is engaged in the performance of the weave poles in order to gain the next technical handling position. 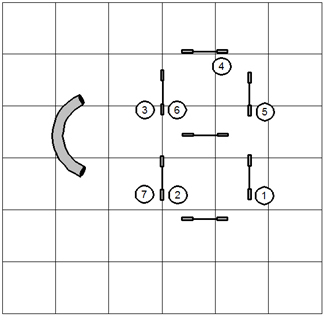 Again the handler has a position forward of his dog to precue the turn. The cruel part about this moment is that the handler has to draw the dog around carefully to set the line through jumps #11 and #12. This is a type of Front Cross that I call a serpentine Front Cross. Truly it is a combination movement: Front Cross to Post Turn. The key to the successful Post is to release on the line. Release too soon and the dog is over jump #6. Release too soon and the dog goes from #11 to #4. The tough part about surviving this moment is that it leaves the handler woefully behind the dog on the approach to jump #12 which is immediately followed by a difficult transition. At jump #12 the handler is left behind the dog. I’m showing here a Post & Tandem approach to the #13 jump (optimistically showing the dog avoiding the run-out plane of jump #13). The Post needs to be a static Post, with the handler showing brakes to draw the dog back as though going to the dogwalk. At just the right moment the handler will flip the dog away in a Tandem Turn. I may have over-elaborated the turn (dog’s red line). In fact the handler really has to hold the Post opening up the approach to the jump. At the heart of our set of obstacles on the floor is a jumping configuration for the letter E, taken from Nancy Gyes alphabet drills. The workbook and CD are available from Clean Run Productions if you’d like to play along. I’ll be going through all of the drills in the next year. This is a great set of jumps, exploring the relationship between two adjoined pinwheels. 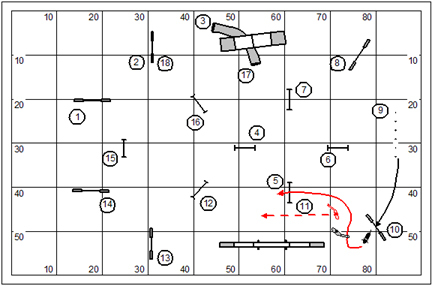 I will leave our instructor with a page or two of drills, right out of Gyes’ Alphabet workbook. The Book of Agility Games, 3d ed (beta) is now available in our web store. I have yet to add all of the hypertext links and enable loading of a course directly into CRCD simply by clicking on the picture. However, I’m being besieged by queries after the book. This is a one-of-a-kind reference to all manner of games played in agility, around the world. Please note that everyone who buys a legal copy will get a coupon towards the Final draft reimbursing you for the cost of the beta. In what movie based on semi-autographical book by Earnest Hemingway did a notoriously gay actor play the part that was presumably Hemingway? Who was the actor? Though I’m a huge fan of Hemingway the writer; he was a notorious homophobe, racist and sexist. I suppose he’s rolling over in his grave about the casting in the movie. Our lesson plan this week will feature the letter “D” from Nancy Gyes’ alphabet drills; (the CD with all the course maps and the workbook are available at www.cleanrun.com). 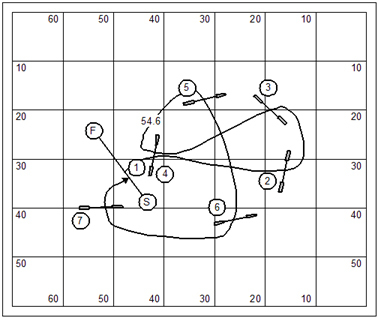 The lesson plan also features our game for the week… Quidditch. Hairy Pawter’s Quidditch is the invention of Becky Dean and Jean MacKenzie. The game was played for the first time at Dogwood Training Center in Ostrander, Ohio. The rules for this game didn’t make the publication deadline for the Clean Run Book of Agility Games (2d edition), as these rules were under review by the athletic faculty at Hogwarts at the time. There is no rushing those wizards with tenure. However, the game will be available in the Book of Agility Games, 3d Ed., available soon at www.dogagility.org/newstore. Big dogs will have 60 seconds and small dogs 65 seconds to complete three numbered sequences. When time expires the dog should be directed to the table to stop time. The point values for each of the sequences are 15 points (black circles), 20 points (white squares), and 25 points (white circles). Each sequence can be successfully completed only once. The sequences can be taken in any order. Each obstacle has individual point values that are earned by a team if a sequence is only partially completed prior to time expiring. Upon the successful completion of a sequence the team will have the opportunity to earn bonus points for a successful performance of a tire; the ‘Beater’ bonus, for which the team will earn an additional 25 points. Dogs must be sent through the tire from outside the containment box shown on the course in order to earn the Beater bonus. Refusals will be faulted on the tire, but nowhere else on course. The initial direction of the dog’s approach to the tire will define the run-out plane of the obstacle for the purpose of judging refusals. If a dog commits a refusal on the tire, the Beater bonus is lost. After attempting the Beater bonus the team should attempt another sequence. If the team completes each of the different sequences, they will earn a ‘Keeper’ bonus of 50 points in addition to the points of the individual sequences. Note: the bonus points earned or missed by the completion of the tire do not affect ability for a team to earn the Keeper bonus. A dropped bar, fly-off, some off-courses (see wrong course rule, below) or missed contact will be considered a sequence fault. 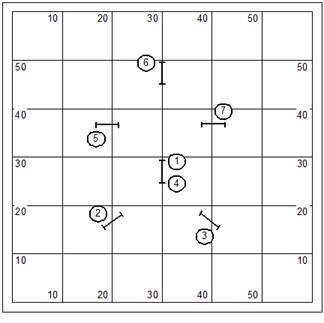 The team can immediately reattempt the same sequence or move to another sequence. 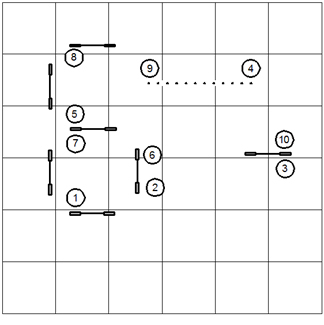 If the whistle sounds prior to the completion of the three sequences, the dog should be directed to the table. 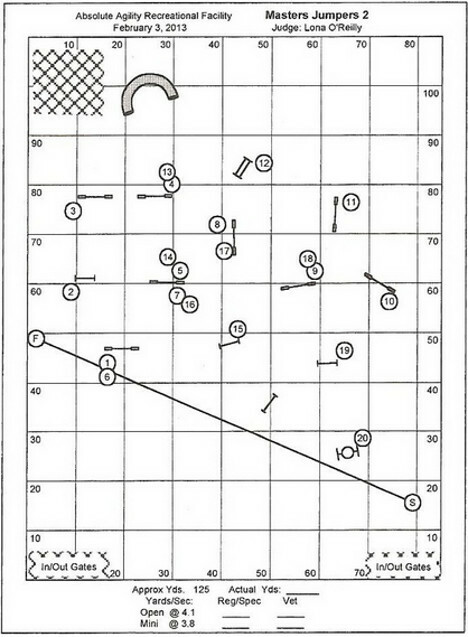 The team will earn individual points for obstacles completed prior to the sounding of the whistle. When the dog touches the table, time will stop. No table performance is required. If a team successfully completes all three sequences, earns all three 25 point Beater bonuses, and touches the table prior to the 60-second whistle sounding, the team will earn the ‘Golden Snitch’ award of 75 bonus points. Quidditch is scored Points, Then Time. The dog with the most points wins. In the case of a tie, the dog with the shortest time will be the winner. The dog and handler step into the ring as a team. The judge’s riddle will offer both curious passage and unexpected twist for the team to solve all in a rush in an aura of palpable expectancy. What I intend to develop with my boy Kory as we work through the alphabet drills is teamwork, pure and simple. Technical practice is the key. I must know how to give the instruction/word by movement or verbalization for whatever confronts us in the moment. And Kory must know his working response. The Alphabet Drills are like practice at sword play, like Samurai’s sparring, developing instinct, understanding, and muscle memory. With Kory this was far simpler than I’d imagined. I begin with a slight cross-the-body precue; and pull it off neatly with an RFP in which I never bother to give full rotation. The key to this handling challenge (to any?) is understanding the dog’s path. Here, I’ve drawn the box threadle movement. 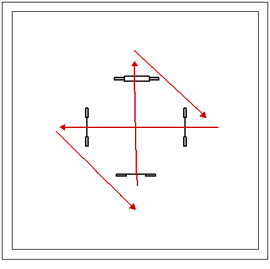 It’s important to see the three lines of the dog’s path in the movement, and the two corners. The handler must support the dog in every line. And corners are always timing events. Without seeing the lines, and corners, it’s pretty hard to do your job. 270s in box work might have a variety of handling solutions. What’s good for the fast dog handler is almost surely a disaster of lackluster handler participation for the slow dog handler. For me and Kory this went to the fast dog end of the scale. The tricky bit for me was bringing my boy into the box in a way that establishes the line straight through the box; rather than offering the wrong-course corner-cut. Ah! If the 270 is a corner-cut it’s a considerably easier exercise. The handler can constantly hedge the line to ensure the corner-of-the-box performance. But don’t you know, this is not a true 270° turn. A compilation volume of Nancy Gyes’ Alphabet Drills has been published by Clean Run Productions. I’m sure you can find a copy on the web store; www.cleanrun.com. The price is $29.95. I’ll be working through the alphabet drills (and inflicting them on my own students). I hope you get the book and follow along. 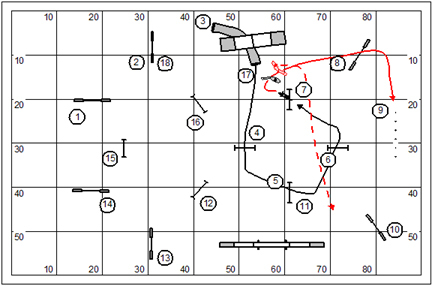 There is a cd with the book that has the exercises in Course Designer .agl format. Life has been hectic recently what with our ramped up trialing adventures. I have other obligations as well: judging, seminars, and clinics. As I write this I’m outbound for Eugene, OR. I stepped in to cover a judging assignment for Dave Seeger who died of a heart attack nearly two weeks ago. My chores have bunched up on me a bit. Have you ever felt guilty for doing what you’re doing even though it needed doing just because there’s something else that needed doing too? Yah, it’s kind of like that. Last Tuesday I spent four hours in the morning with our yard help. This is a kid we’ve hired to do mowing and other miscellaneous chores. You know how it is with kids! This boy works for two minutes and then rests for five. So I set out to lead by example, and show him what work looks like. Our mission was to clear downed limbs and branches on either side of about ¼ mile of road on our property. We dragged the stuff onto the road into piles, then I’d come through with the tractor and wagon, load it, and haul it down to the burn pile by the pond. About a half hour into the job I stopped to point out that I’d made this great big huge pile; while he’d made a couple dinky little piles of twigs. So I gave him a short talk about how he shouldn’t be getting outworked by a 60 year old man. On the last load of the day I took the kid down with me to the pond. When we were done unloading that last haul I pointed at the huge pile we’d made. He was pretty impressed. I told him that all work is measurable. And in this world he needs to learn to make bigger piles than anyone elses’s. Oh, I paid for my hubris alright. For the next couple days I was feeling the effect of spending four hours in the sun outworking a 14 year old boy. On top of my arthritis meds I had to take a couple OTC pain pills for my aching body. Which of Shakespeare’s characters called down the tempest? You are currently browsing the archives for the Gyes’ Alphabet Drills category.